If you are new to Board Service or needing to amplify your existing Board these courses are what you need. Join in the training mission that delivers results and teaches effectiveness. To further your knowledge and skills, complete one of our recognized Certificate Programs which focuses on the most pertinent aspects of Board participation and management. Learn about the methods and best practices behind successful Boards. These training courses cover topics including Board Governance, Financial Liabilities of Board Members, Leadership Development, Differences Between Fundraising and Development, NPO Language and Vocabulary, Ambassador Service and more. Our Online curriculum includes presentation notes, group exercises, assessments and a fully developed NPO Lexicon plus the ability to review the courses as often as you like. Designed by the American Nonprofit Academy for NEW Board Members, this curriculum takes on all aspects of Board service. From understanding how a Board Member is an ambassador of the nonprofit to the financial and legal implications of Board service. This includes more than 15 hours of excellent training and is supported with 12 bonus course materials such as worksheets, exercises and even the Board Member Lexicon. Created by the American Nonprofit Academy, the dictionary of vocabulary used in the nonprofit sector has specific definitions that will help any new Board Member get up to speed quickly. It’s hard enough to accomplish a nonprofit’s mission, vision and values set, but trying to do it with poor meeting structure drives Board Members away. Learn how to navigate virtual Board meetings, different types of agendas, including consent agendas. Sample agendas are included as bonus materials. Learn how to use proxy voting in order to meet quorum requirements and how to legally proceed with a meeting. At the end of the day, if your nonprofit is not in compliance with Board meeting policies, votes and actions taken by the Board may not be legal! Board governance is a dominant topic. But what is it and how does a Board Chair steward this? Learn how to manage meetings, lead through conflict of issue policies, work with a dedicated Board Liaison and tackle all Board Chair required duties. The program includes four specific courses, downloadable course materials that can be shared with the Board and management. This Certificate Program is designed to take Board leadership to the next level with a specific track to effective governance and compliance. The foundational support and leadership of a nonprofit comes from the Board of Directors, Board Officers and Support Boards. Learn how to cultivate strong Boards, how different types of Board structures function and how to manage them. Passion for a nonprofit mission is not enough. There are recruitment strategies, vetting of potential Board Members and then keeping them engaged during service. This Certificate Program includes Board Assessment tools, understanding Young Professional Boards, as well as the process of strengthening Board diversity. 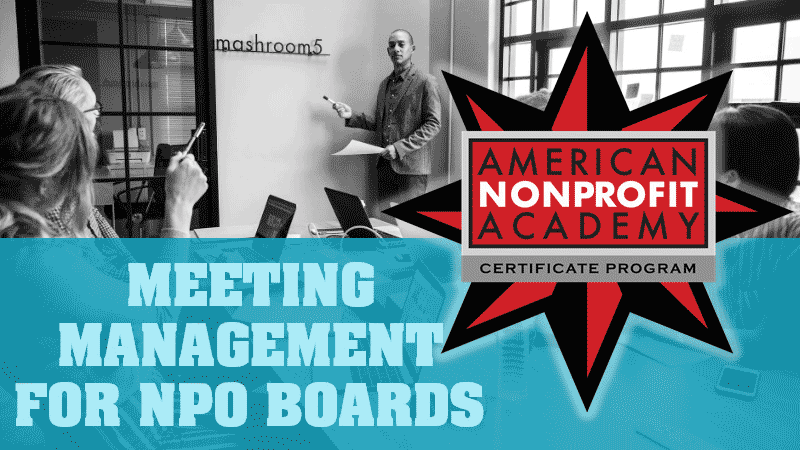 10 self-study-paced courses designed by the American Nonprofit Academy specifically for nonprofit Board Chairs. This curriculum helps Board Chairs understand their leadership responsibilities, management directives, succession, CEO review and legal compliance. Course topics also include engaging and inspiring the Board to serve the nonprofit to the best of their abilities. Board Chair Scenarios and Curveballs take leaders through exercises to see how they could manage unplanned events. The Certificate Program includes 16 bonus materials that will help a Board Chair lead with confidence and results.